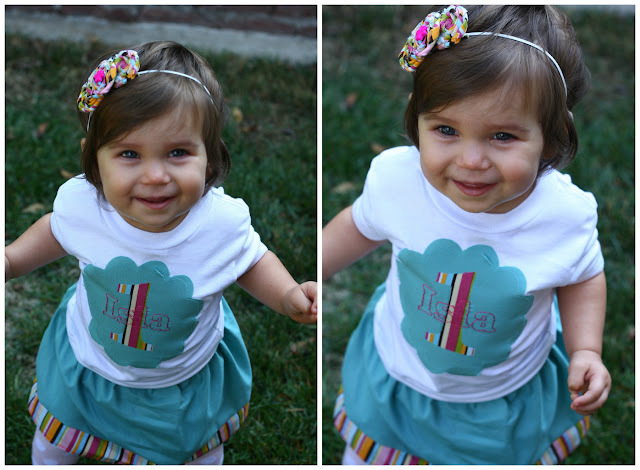 Yesterday we celebrated Isla turning one. Even though I am not a party person and was just throwing her an itty bitty party, I still wanted it to be fabulous. I asked one of my friends to help make a shirt for Isla. Not only did she make Isla a shirt, she quickly made a matching skirt for her while I stood there and drooled stared in amazement. She swore it is super easy. I was super impressed and Isla looked fabulous for her big day. 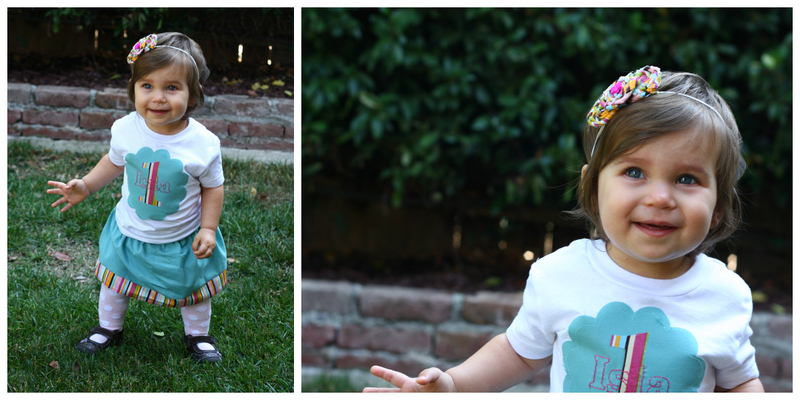 Oh, and I made Isla a matching little headband...it is amazing what one can do with a glue gun! Poor Isla has a cold and was woken from her nap early by all the party preparation commotion. She wasn't her normal happy self and I was afraid that was going to be how she was the whole time. Thankfully she quickly got into the party spirit...except when I wouldn't let her crawl around yet because I didn't want her to ruin her outfit at the beginning of her party! Another talented friend made Isla's cake. 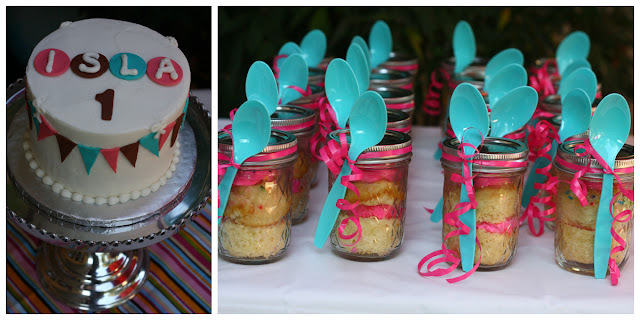 And I made cake in a jar for everyone else. I felt fancy because I actually went to a cake store and bought one of those frosting bags and tips. But basically all I did is make cupcakes, cut them in half, dropped in the bottom, squirt in some icing, put in the top, squirt in more icing and topped with sprinkles. I like how they turned out. Thanks for the idea pinterest! Isla actually seemed to enjoy opening her presents. Of course, Connor was probably still more into that part than she was. 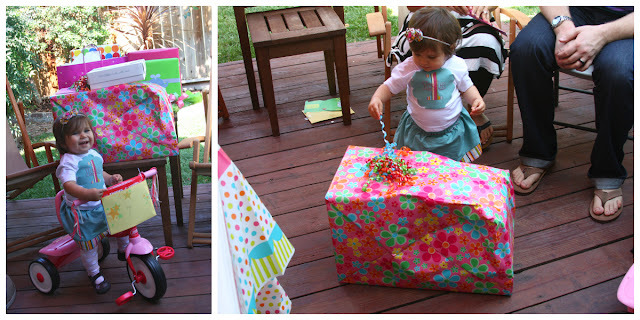 And she did have a bit of her own party with the tissue paper after the presents were all opened. That being said, she still really seemed to enjoy her presents. Her favorites were a ride on shopping toy and a little teapot that talks. After presents was cake time! Isla instantly went for the cake, no problems there. But I had to put a little bit in her mouth before she realized that it could be eaten and not just played with. The whole time Isla was going at the top of her cake, Connor was pulling the flags off the front and eating them. Isla actually ate hardly any of her cake. She really was more interested in playing with it. But Connor, he certainly enjoyed his fair share of it! It was a fun party celebrating our little girl turning one. She actually went down for a nap while the party was still going. So, the rest of us sat around, drank some coffee and enjoyed ourselves. 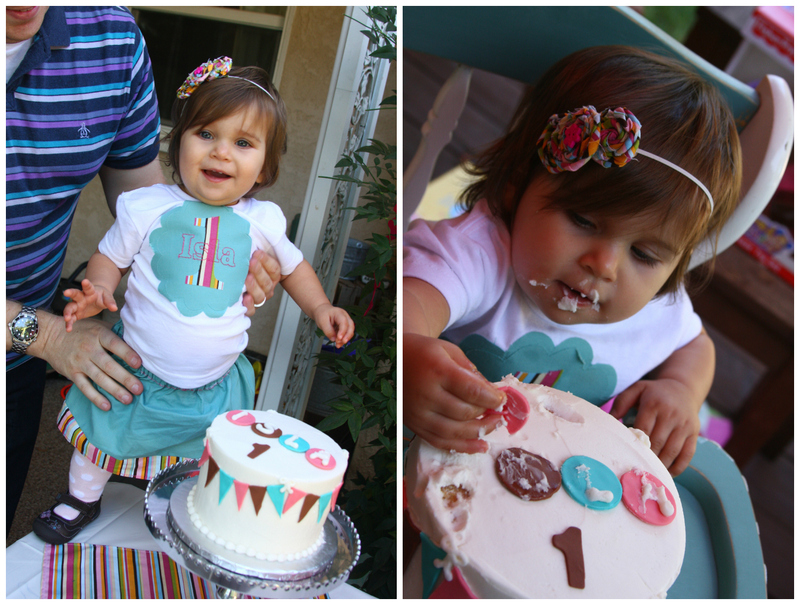 Happy first birthday to my beautiful little girl! Everything looks so great!!! Happy Birthday Isla!! Sorry we missed the party! She looked cute in her outfit, your family pic is great! WOWIE!!! What a super professional looking event! You're like, super mama of the year because not only does everything look perfect, you figured out ways to make things look perfect even when they're 'easy' (like how you described the cake process as not as demanding as one might thing (though I'm still super duper impressed). Little Isla's gonna LOVE having these photos later. P.S. You can plan my birthday right?